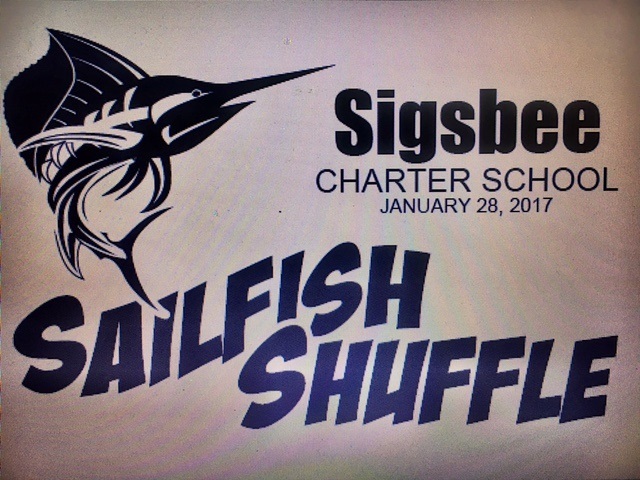 Come join us for the Sailfish Shuffle Color Run 5K on Saturday, January 26, 2019 at 8:00 a.m. This event is open to everyone (the public, Sigsbee students & families, and military) and is on the Sigsbee Military Base (All pre-registered entrants will be allowed to enter base with picture I.D). Let your fitness and color-style show as we get "colorful." All entrants receive a color packet and run through 2-3 x color stations, creating your own piece of physical art while making memories for a lifetime. Custom student-made awards(for 1st - 3rd in each age group), post-race food, and a race T-shirt for all participants. 2 year age groups for 14 and under(6 & under, 8 & under, 10 & under, 12 & Under, 14 & under), then 5 year age groups for 15-99 years old (15-19, 20-24, 25-29, etc.). Friday, January 25, 2019 from 5:00-7:00, Packet Pick-up and registration @ the Old Publix Store, 3316 North Roosevelt Boulevard (Searstown Shopping Center). Saturday, January 26th, 7:00-7:50, Packet Pick-up @ Sigsbee Charter School & race day registration (race-day registration only available to individuals with military I.D./Base Access), 939 Felton Road Key West, FL 33040.